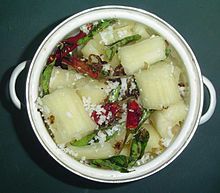 Tapioca (/ˌtæpiˈoʊkə/; Portuguese: [tapiˈɔkɐ]) is a starch extracted from cassava plant (Manihot esculenta). This species is native to the north region and central-west region of Brazil, but its use spread throughout South America. The plant was carried by Portuguese and Spanish explorers to most of the West Indies and Africa and Asia. It is a tropical, perennial shrub that is less commonly cultivated in temperate climate zones. 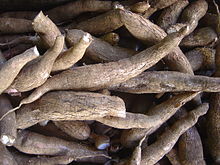 Cassava thrives better in poor soils than many other food plants. 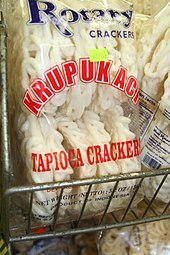 Tapioca is derived from the word tipi'óka, its name in the Tupí language spoken by natives when the Portuguese first arrived in the Northeast Region of Brazil around 1707. 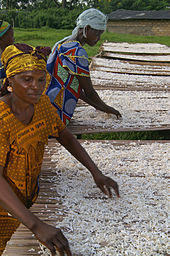 This Tupí word refers to the process by which the cassava starch is made edible. 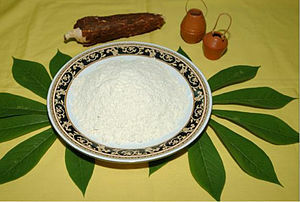 In the north and northeast of Brazil, traditional community-based production of tapioca is a by-product of manioc flour production from cassava roots. In this process, the manioc (after treatment to remove toxicity) is ground to a pulp with a small hand- or diesel-powered mill. This masa is then squeezed to dry it out. 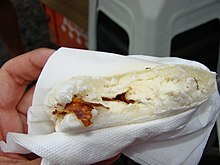 The wet masa is placed in a long woven tube called a tipiti. The top of the tube is secured while a large branch or lever is inserted into a loop at the bottom and used to stretch the entire implement vertically, squeezing a starch-rich liquid out through the weave and ends. This liquid is collected and the water allowed to evaporate, leaving behind a fine-grained tapioca powder similar in appearance to corn starch. 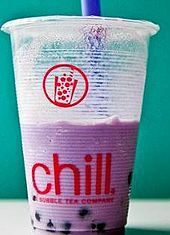 Tapioca predominantly consists of carbohydrates, with each cup containing 23.9 grams for a total of 105 calories; it is low in saturated fat, protein and sodium. 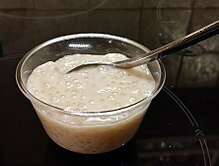 One serving of tapioca pudding contains no dietary fiber, a small amount of oleic acid, and no omega-3 or omega-6 fatty acids. 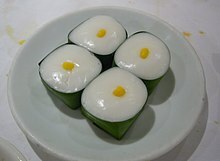 ^ a b c "Puddings, tapioca, ready-to-eat, fat free; one container refrigerated 4 oz. or 112 g". Conde Nast. 2014. Retrieved 28 March 2014.